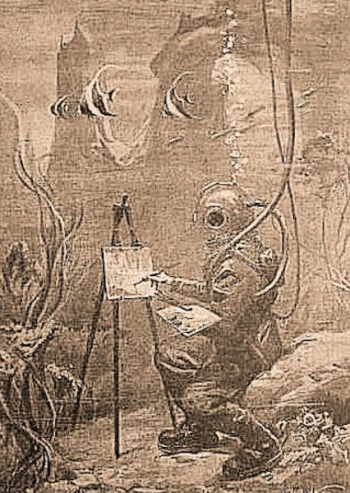 Illustration of Pritchard painting underwater. PRITCHARD, Zahr [Walter Howlison Mackenzie] (1866-1956), painter of undersea scenes. He was born in Madras, India and sent to Scotland for school at age ten. He began sketching underwater scenes there at an early age. After designing a gown for Sarah Bernhardt with an underwater theme, he began selling his works. He arrived in San Francisco in 1906 where he lost 50 works in the earthquake, after which he moved to Los Angeles, where he remained off and on until 1937. He changed his first name to Zahr in about 1909. 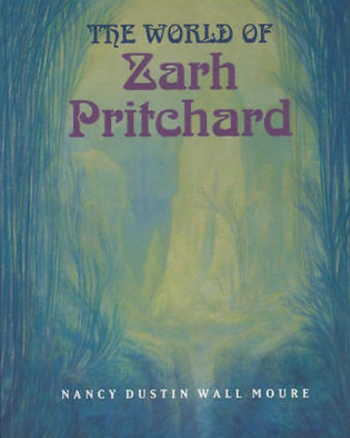 “Pritchard created the art of portraying underwater scenes by sketching them from life. In the early 1900s he produced beautiful illustrations of tropical marine fishes and coral landscapes in the true pastel shades known well to divers. His paintings were praised and purchased by royalty and by natural-history museums, and were exhibited worldwide in art galleries. He held exhibits of his paintings in Tokyo (1919, 1920), Paris (1921, 1925), Rio de Janeiro (1922); London (1928); New York (1913); Honolulu, Pasadena, and several other cities in the United States. Critics and journalists praised his works as harmonious, dreamy, poetic, restful. As an artist, Pritchard was not a member of any of the art movements of the day — cubism, expressionism, impressionism. Outside the realm of the critics of his day, his works were often described as "pleasing" (Burgess, 1994, pp. 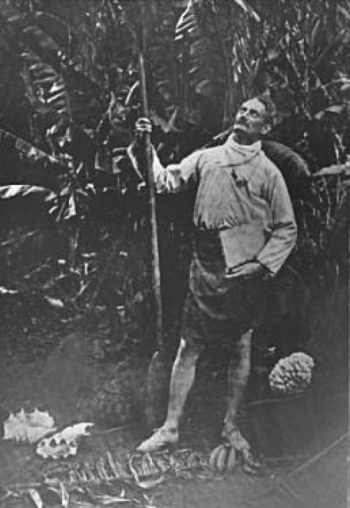 155-158). They sold fairly well, especially to the "nouveau riche." An art critic dubbed him "The Merman," a title that he enjoyed (Burgess, 1994, p. 138). Pritchard died in Austin, Texas on August 29, 1956. His works are held by Scripps Institute, La Jolla, CA, the Cleveland Museum of Natural History, and the American Museum of Natural History. c. 1913: “...A heavy northwest wind and swells outside, the Gussie M arrived in the bay [Pelican Bay, Santa Cruz Island]. Captain Vasquez came ashore with an artist, who said he had put on a diving suit and helmet, and dove down into the ocean around the marine gardens. He had with him waterproof crayons and sketchbooks, and the scenes at the bottom of the ocean were beautiful. He said he would finish them in his studio...” [Eaton, Margaret Diary of a Sea Captain's Wife, Tales of Santa Cruz Island, Santa Barbara, McNally Loftin, 1980 p. 189]. This page was last edited on 6 June 2018, at 07:34.